It is unlikely we will ever see repeated what is set to take place on this most special Sunday. For the second and last time, the gloriously chic Chantilly, France's spiritual home of the thoroughbred, stages the prize that annually bestows upon its winner a place in sporting immortality. This is an Arc that is rare and wonderful. So, too, is the filly who through summer into autumn has dominated the build-up and now starts as scorching hot favourite. Come October's first Sunday in 2018, the annual British invasion of Longchamp – set to be rechristened ParisLongchamp when its doors are reopened in April – will resume. This time, as 12 months ago, the Brits are bound for Chantilly and head there with great expectations thanks to the winning machine that is Enable. Tour de force displays in the Oaks, Irish Oaks and Yorkshire Oaks, and crucially also in the King George VI and Queen Elizabeth Stakes, have placed Enable head and shoulders above all rivals in bookmaker lists for the 96th Qatar Prix de l'Arc de Triomphe. Such has been her majesty that some odds-compilers have quoted her at odds-on for a contest that rewards the victorious connections with a first prize of nearly £2.5 million. Yet history, and an opposition cast list that oozes quality, will ensure this should not be a simple stroll by the forest. Never before has a British-trained filly captured the Arc. No jockey has won a fifth Arc. Enable seeks to annul that first statistic. If she succeeds, Frankie Dettori will overcome the second. It is only two years since Dettori, then – as now – teaming up with Enable's trainer John Gosden, conquered the Arc for the fourth time. The hero of that hour was Golden Horn, triumphing on an afternoon when so many had hoped France's sweetheart of the turf, the mighty Treve, would score for the third consecutive year. 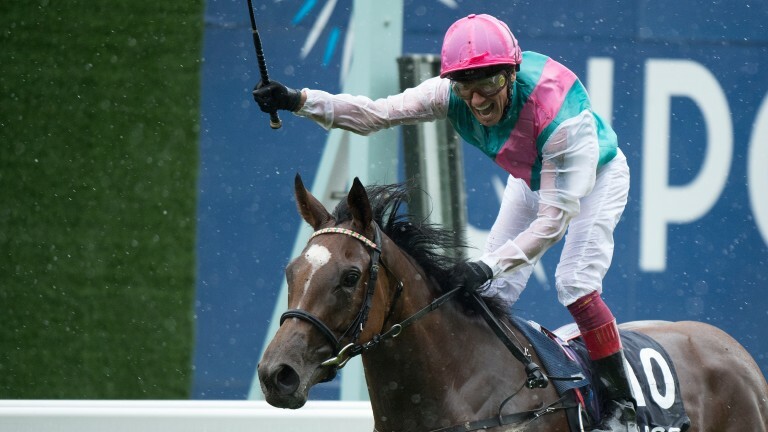 Unlike, Treve, Enable is at the right end of the weight-for-age scale and receives 10lb from her nearest King George victim Ulysses, beaten four and a half lengths at Ascot. However, since then Ulysses has produced his best performance to date, thumping Churchill and Barney Roy in the Juddmonte International. For the Sir Michael Stoute-trained four-year-old and his champion jockey partner Jim Crowley, the less rain that falls on Chantilly the better. For Enable that is less of a concern. For both horses a decent start would be helpful given they have the two innermost berths in stalls one and two. There have been two true superstar fillies racing in Europe this year. We have long expected one of them to line up in this Arc. The presence of the other is a welcome surprise. Nobody can accuse Coolmore of not doing everything in their power to win this season's ultimate European championship. 'The Lads' have added significant extra spice by adding into the mix the magnificent Winter. Ryan Moore's presence on her back, when his alternative mounts included outstanding stayer Order Of St George and recent St Leger winner Capri, further boosts the spice factor. We can be sure Order Of St George and Capri will stay, as will Seventh Heaven and Idaho, who also represent Aidan O'Brien, last year responsible for the one-two-three in Chantilly's first Arc. Moore picked right that day. He will hope he has found the right one again, but for that to happen Winter, a dazzling miler who has yet to be tried beyond ten furlongs, will need to prove potent over a mile and a half. If she does, the decision to run her may well look to have been inspired. As ever, this is a fantastically international Arc. For the home team, Prix du Jockey Club winner Brametot and the Aga Khan's Zarak are joined by a three-strong Andre Fabre team. Dschingis Secret, so impressive in the Prix Foy, is one of two German representatives, while Satono Diamond, disappointingly lacklustre in that same trial, seeks to end Japan's long wait to discover how sweet Arc glory tastes. Across the rest of a sparkling card, the French will also have to fight hard to keep hold of their own Group 1 prizes. O'Brien and Charlie Appleby are strongly represented in the two juvenile features, and also the Prix de l'Opera, while in the Prix de l'Abbaye – which finishes closer to Chantilly's railway station than the Chantilly grandstands – the Elite Racing Club's defending champ Marsha is back for Sir Mark Prescott and with fellow raider Battaash as her biggest danger. Marsha is blessed with exceptional speed. Enable is blessed with a combination of speed, stamina and stunning ability that has made her horse of the year. Now, as Chantilly bids farewell to the Arc, Frankie and his fabulous filly face their moment of destiny.